Raw natural gas contains a combination of solids and liquid contaminants including water vapor, acid gas such as hydrogen sulfide (H2S), carbon dioxide, helium, nitrogen and other chemical compounds. Parker Twin Filter offers gasfilter cartridges for solids removal for natural gas designed and configured iaw Dutch Gasunie standard MSW-12-E, NEN1059 and the KVGN supplement. The Parker Twin Filter gas filter cartridge is designed for the efficient removal of sand, dirt, dust, coal fines, pipescale and other contaminants from gas pipelines and compressed air. The design offers maximum filtration area within a compact filter assembly and provides positive gasket sealing to prevent by-pass. High dirt holding capacity, low pressure drop and long lifetime are assured. The standard filters have dimensions that are applicable in most common housings. It is possible to custom-design specific cartridges, within the standard guidelines, depending on the existing/desired (process) situation. 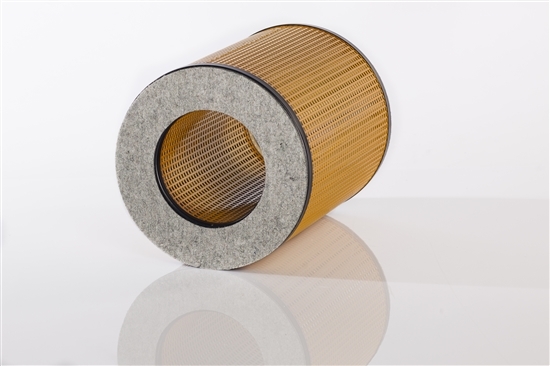 The filter medium is usually a multi-layer polyester needle felt allowing for depth-filtration in combination with a high dirtload capacity. For liquid removal we refer to our liquid-gas coalescers. Filter Media Pleated polyester needle felt. End Caps Double Open-End configuration, epoxy coated steel. Heavy duty version for applications where higher differential pressure is required. Tailor made versions with other materials and/or dimensions.